Educators gathered at Grand Canyon University for the conference. Speakers and exhibits highlighted the theme of "Common Core: Staking a Claim in the 21st Century." Exhibitor Renee Ochsner provided information about the Nazi persecution of Jehovah's Witnesses and curriculum materials on the Arnold-Liebster Foundation website. Arizona Council for the Social Studies includes the Arnold-Liebster Foundation on its Websites of A.C.S.S. Affiliated Organizations & Classroom Resources for teachers and social studies specialists. Skype conference with 120 8th grade students and Simone Liebster. The Illinois Council for the Social Studies Fall Conference was held at Harper College in Palatine. 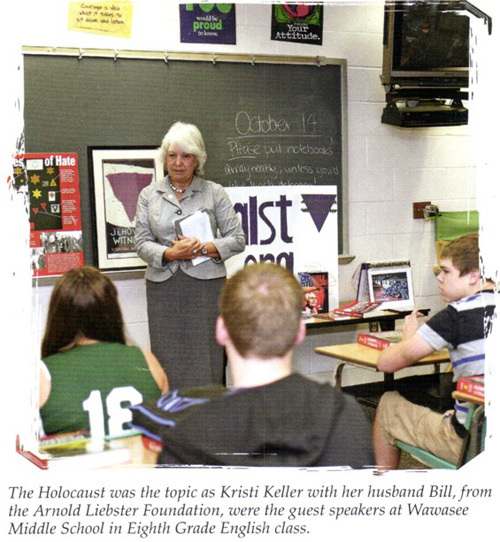 A teacher workshop by Gaye Flowers presented an in-depth look at Simone Liebster and curriculum resources on the Nazi persecution of Jehovah's Witnesses. The Arnold-Liebster Foundation's exhibit table at the 11th Institute for Holocaust Education provided general information and curriculum resources for educators, students and community members in attendance from Iowa and Illinois. Skype conference with 11th and 12th grade students and Simone Liebster. 12th Annual Martin & Doris Rosen Symposium on Remembering the Holocaust: A Summer Symposium for Educators and the Community. Contributed to the Institute by providing curriculum resources and online teacher packets. Diana Zientek presented information about the Nazi persecution of Jehovah's Witnesses. 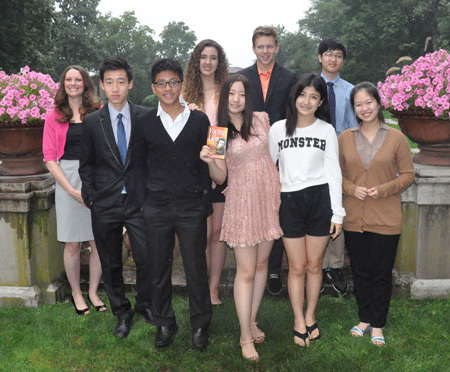 Education Law's 2013 Summer Residential Institute included a lecture by Denise Baker. Featured was an interview of Simone Liebster via Skype. This memorial to Max Liebster, honorary citizen of Reichenbach, should remind us of all who have suffered unjustly under the National Socialist regime, and stimulate us to think about our own values and goals. Contributed to the Institute by providing online teacher packets and curriculum materials. This workshop was part of the 2013 Professional Learning Summer Workshops held by Alabama State University and conducted by Leonita Nelson, Consultant with Montgomery Public Schools. Teachers participated in an interactive video conference with Simone Liebster from France using Skype. Simone's refreshing message encourages students to stand up for what they believe and to resist peer pressure. Two Skype conferences with 7th and 8th grade students and Simone Liebster. 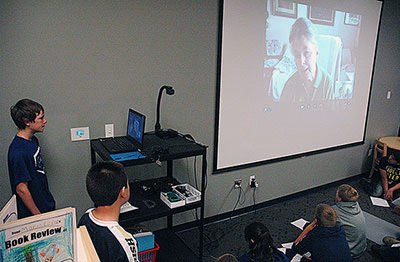 Two Skype conferences with 6th grade students and Simone Liebster. Quincy University is a partner with the Library of Congress for the national program of Library of Congress Teaching with Primary Sources. This program is designed to help educators access and implement into their curriculum primary source items. Marge Fulton presented online primary sources related to the Nazi persecution of Jehovah's Witnesses. Skype conference with 9th and 10th grade students and Simone Liebster. 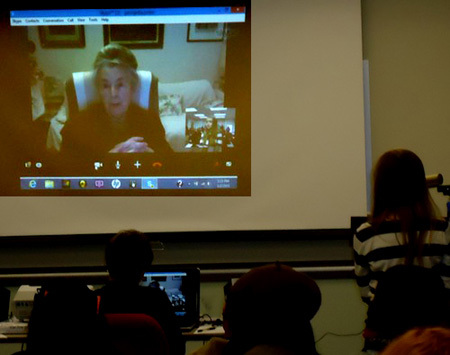 Students at Leesburg Elementary were offered the unique experience of speaking with Simone Arnold Liebster, a Holocaust survivor living in France. Middle and high school teachers attended this workshop presented by Marge Fulton and Gaye Flowers at the Illinois Council for the Social Studies Spring Conference. The event was held at Southern Illinois University in Edwardsville. A Skype interview with Simone Liebster was a highlight of the workshop and an exhibit table featured curriculum materials. The Oral History Archive is housed in the Carole Weinstein Holocaust Research Library and contains over 230 digitized testimonies from people who witnessed genocide firsthand. The Virginia Holocaust Museum started collecting this testimony in 1997. The Oral History Archive now includes the testimony of Simone Arnold Liebster. A History Symposium was held for grades 6-12 teachers and student teachers at McLean County Museum of History. Joint sponsors were Illinois State University History Department, McLean County Museum of History, and Regional Office of Education #17. Exhibitor Marge Fulton provided information about the Nazi persecution of Jehovah's Witnesses and curriculum materials available on the Arnold-Liebster Foundation website. Skype conference with a group of homeschooled students and Simone Liebster.